The last time we heard of a new dual-screen device from Microsoft was back in July, when an internal document describing a pocketable Surface leaked. 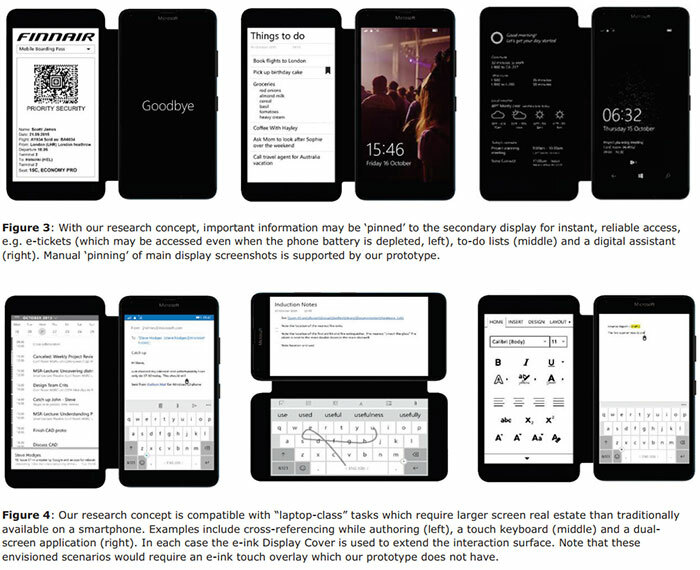 Today a more modest interpretation of a dual-screen device comes from Microsoft research - a prototype for a smartphone flip cover which packs an e-ink display. The source research was completed back in 2015 but only recently surfaced in an update to the Microsoft Research Blog. That might explain why the phone used in the prototype was the Lumia 640 Windows Phone. The concept behind the prototype is of a "secondary screen designed to improve productivity and convenience". Microsoft's "practical solution" seems a good one as it is an option which users can pay for and equip, if they so wish. Microsoft's researchers noted that the small-ish display on a smartphone constrains many tasks. However people increasingly use such devices in place of larger screened devices like tablets and even PCs. Survey participants "didn't want a physically larger phone," so Microsoft explored several second screen implementations with an eye on cost effectiveness, utility value, and reliability. It settled on "a touch-enabled e-ink second screen built into a regular protective flip-cover", which you can see pictured and described in the research paper PDF. The prototype cover was under 3mm thick, which is comparable to a regular 'dumb' smartphone wallet style cover. Microsoft used its signature Alcantra fabric and this formed a protective bezel around the e-ink display meaning it wouldn't 'grind' against the regular smartphone display. Some touch buttons were placed in the bottom bezel for both form (uniform thickness) and function possibilities. Please note that Microsoft didn't use a touch-enabled e-ink display in the prototype "for expediency" but the five buttons below the screen allowed for sufficient screen control. Various applications are explored in the images of the dual-display in action. The Bluetooth connected accessory showed off the multi-tasking appeal, and the second screen being used for input or regularly used UI furniture in various apps. Users who got to test out the prototypes said the lack of colour and touch screen functionality steered the second screen to be most useful for pinning information such as electronic boarding passes, train timetables and shopping lists. Microsoft thinks both those issues could be addressed by advances in tech. Yes but no. The idea of having a second display whilst typing in Word in portrait to allow all those extra buttons is great until you consider how you're going to hold it and get your thumbs to the keyboard. The second screen will get in the way of your left hand and be flapping in the breeze unless you have it flat on a surface which just won't be comfortable. It might be useful for keeping a reminder list / calendar easily accessible and always there as well as the time. The landscape keyboard idea seems good but ergonomics are going to be awful and typing properly on one of these keyboards is not easy. I think the biggest use for this kind of thing would be for people with e-readers who want an e-ink screen but don't want to carry round a full sized e-reader. I feel as though they may not enter the mobile market in the traditional sense, but they may make a mobile sized computer instead..?